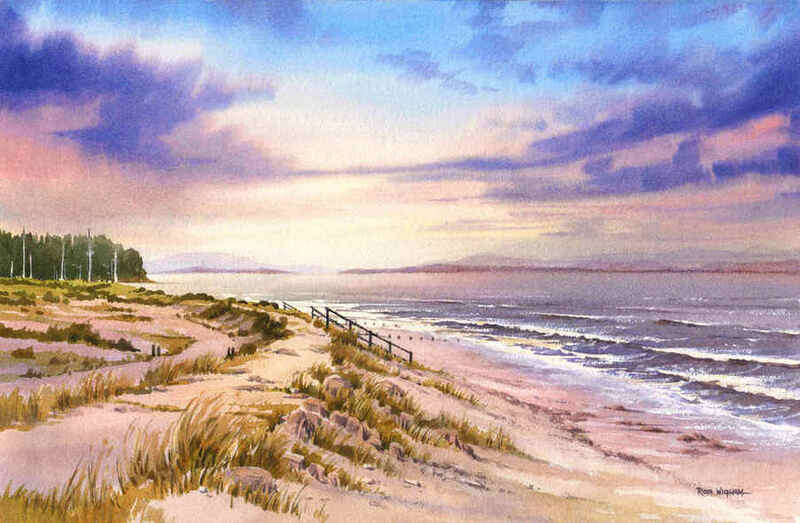 'Findhorn Sunset', watercolour, 52 x 33 cm. This is a view from the sea wall above Findhorn Beach at mid-tide; the boat yard can be seen at left, close to the entrance to the bay. Here, we're looking across the Moray Firth where the mountains of the east coast of Sutherland are just visible through the evening haze. The gap visible just above the steps is the entrance to the Cromarty Firth around Nigg. Oil rigs undergoing maintenance can often be seen in this firth, but not in this romantic sunset view! I was delighted with how this painting turned out and was grateful that the new owner was happy for me to do a run of prints from it - I hope you like it too!